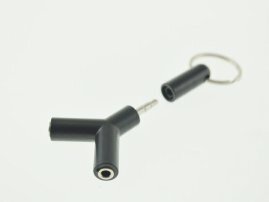 Key Chain Ring Audio Y-Splitter 3.5mm Male to Dual 3.5mm Female Adapter for Headphones and Speakers : allputer.com - Accessories for all your Portable Electronics & Computers! Why split earbuds when you can both have your own headset? This splitter allows you to plug two pairs of headphones or two speakers into any headphone-jack-enabled device with one port. Two jacks are better than one. Share the music on your iPhone / iPod, Smartphone, Tablet, MP3, in the way you love, with the people you love. - Comes with a keychain Ring for easy carry.